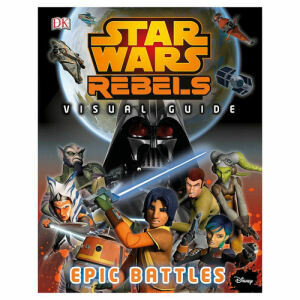 We have Just Sold out of Star Wars Rebels Visual Guide Epic Battles Hardcover Book. Not to Worry! Fill in the Notify me When Available and you will be the first in line for our restock of Star Wars Rebels Visual Guide Epic Battles Hardcover Book !! From the Star Wars collection by DK Publishing. Star Wars Rebels Visual Guide Epic Battles Hardcover Book. This hardcover book is the ultimate batklle guide for the Star Wars Rebels fan. 144 pages. Measures approximately 11.3 inches tall by 8.4-inches long.